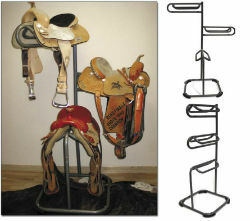 The top two saddle racks swivel 360 degrees. Each rack has a bridle hook on the end. Powder coated steel frame with rubber non-skid feet on the bottom.